Raw Ribbons was developed through an organic exchange of making and drawing. Jilly Morris and Jane McKeating spent several months posting items to each other, each responding and then returning. Having previously never met, both artists got to know each other through this intuitive dialogue. Raw Ribbons became a visual conversation between the two artists. Each voice expressed through mark-making and responding to the other's marked surface. Over time a series of paper scrolls and silk ribbons were created to form 'Raw Ribbons'. 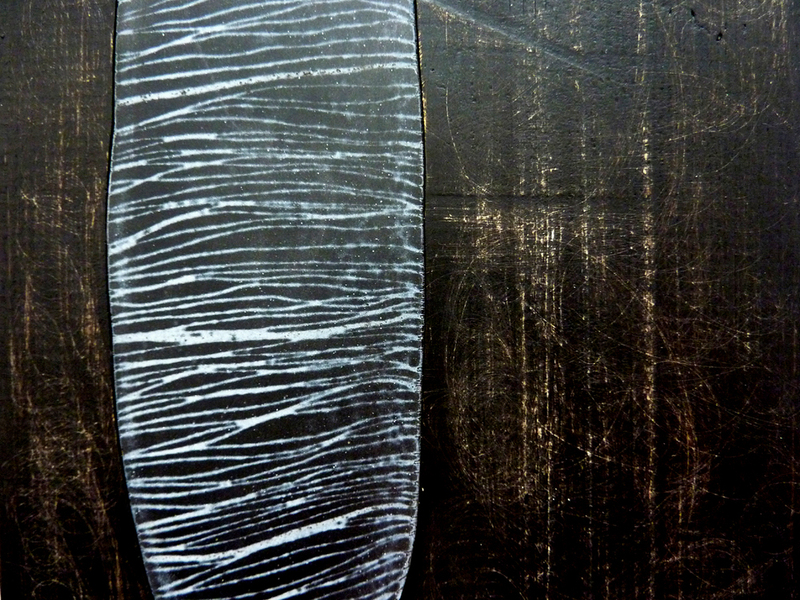 This work is a shared celebration emphasising the beauty, purity and rawness of materials, mark making and collaboraton. 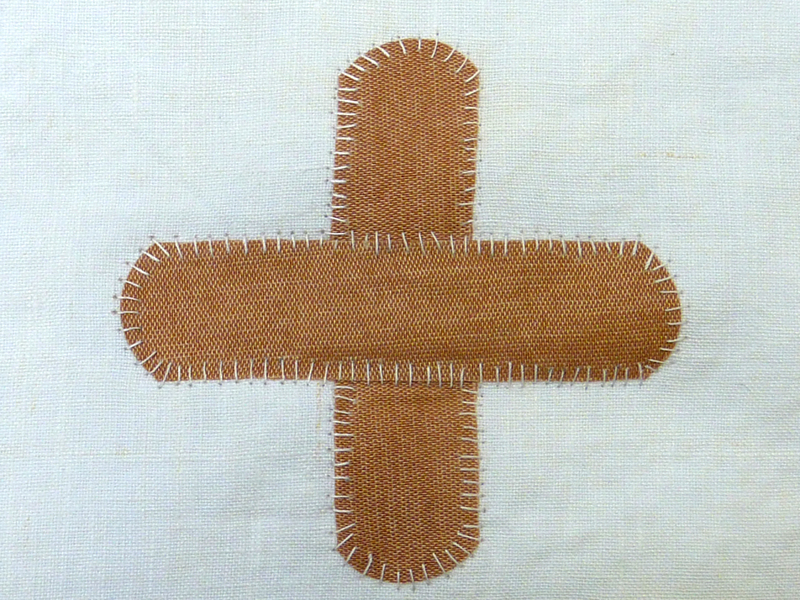 STITCHING & THINKING mending at the museum - Bristol Museum. 'Stitch and Think' was a research group developed by Janet Haigh and Dawn Mason at the University of the West of England. In collaboration between UWE and Bristol museum textile collection, the group created an exhibition called 'Stitching & Thinking, Mending at the Museum', in response to the beautiful darning samples held at the Red Lodge in Bristol. 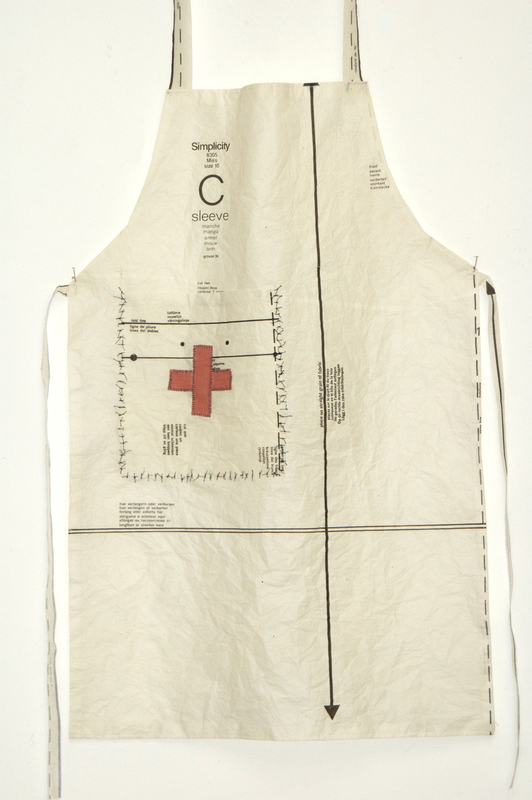 'Mending Takes Time' emphasises today's quick-fix, inexpensive and disposable culture by stitching first-aid plasters onto an installation of self-made aprons. In association with PlaCE, a creative arts practice-led research centre addressing issues of place, location, context and environment based at the University of Bristol, I was invited to make work for a touring exhibition that involved using enamel and the context of place. I created 'Twelve Markers', a series of large wooden struts with enamel inserts. I wanted to create an artwork that embedded a cellular code of history into a structure that looked from a distance either like the beginnings of a wooden building or its demise. I created a gigantic bar-code as such, interweaving a series of pasts in the organic marks I produced in the enamel inserts. A sixty second, stop-frame animation of a mile walk created whilst in residence in Northumberland, capturing the terrain and sound of pink wellies on a journey.